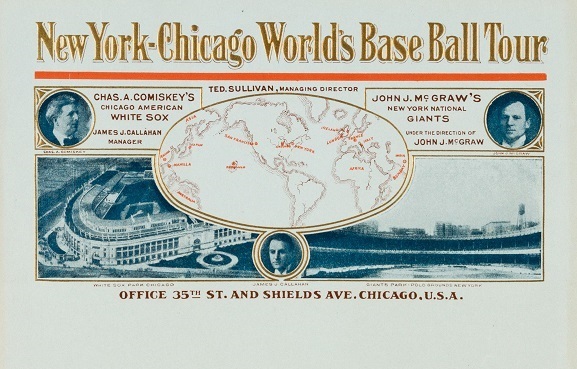 The 1913-14 World Tour marked the first time that big baseball stars toured Japan, with John McGraw and Charles Comiskey helming a crew that included Tris Speaker, Buck Weaver, Jim Thorpe and others. The baseball tourists pitted the the Giants against the White Sox, along with players from other teams, duking it out in Japan, China, Philippines, Australia, Ceylon, Egypt, France, and England. 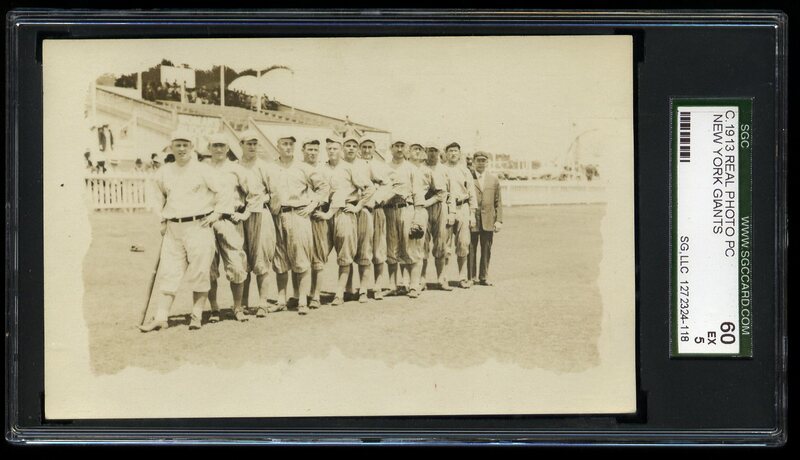 Highly scarce Real Photo PC of the NY Giants 1913-14 World Tour team with umpire Bill Klem in Nice, France. Pictured are John McGraw, Jim Thorpe, Mike Donlin, Fred Merkle and others, including non-NY players in uniform just for the tour. This image likely is from February 16th, 1914, when the Giants lost to the White Sox 10-9. Before the game, ex-Olympian Thorpe put on an exhibition, throwing the discus and shot put. (L-R) John McGraw, Hans Lobert, Mike Donlin, Lee Magee, Larry Doyle, Ivy Wingo, Bunny Hearne, George "Hooks" Wiltse, Mickey Doolan, Urban "Red" Faber, Fred Merkle, Jim Thorpe, umpire Bill Klem. 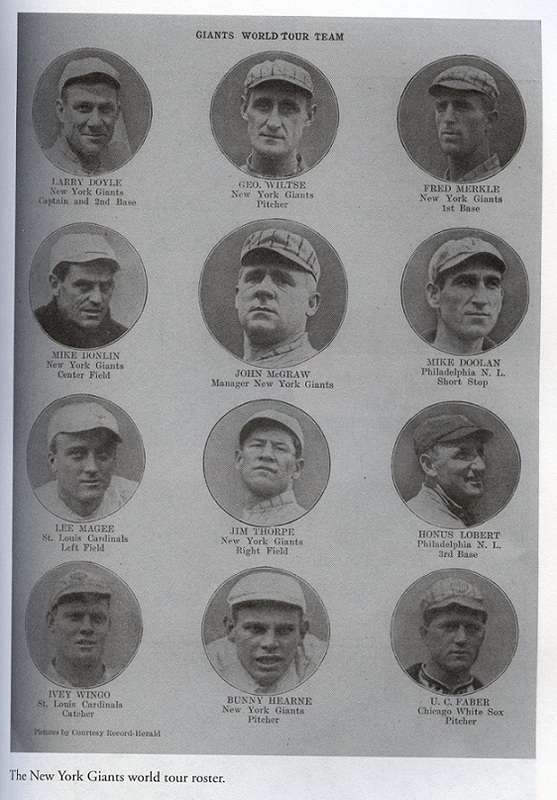 In addition to several Giants players (including rookie star, Jim Thorpe), the "New York" team included a few non-Giants signed by McGraw for the 1913-14 tour of the word with the White Sox. Lobert and Doolan were "borrowed" from the Phillies for the journey. Magee and Wingo, meanwhile, came from the St. Louis Cardinals. Donlin, the former Giant star, came to the tour by way of Newark of the International League. He had been out of baseball in vaudeville with his wife, actress Mabel Hite, for a few years and then returned to the Boston Rustlers, Pittsburgh PIrates, Newark and back to the Giants after this tour. 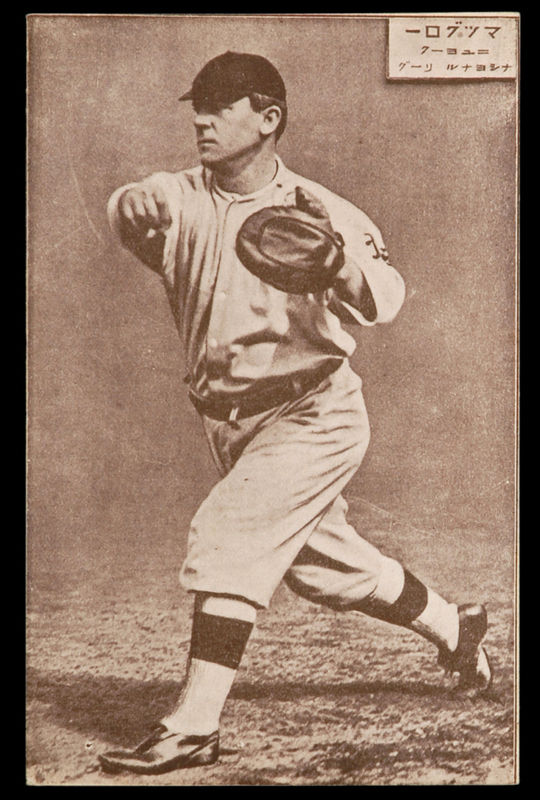 Pitcher Faber actually came from the White Sox -- the Giants' tour rivals -- who loaned him to McGraw's team which was lacking a pitcher. The future Hall of Famer was a promising minor league prospect for the Sox and McGraw even attempted to acquire him for the Giants permanently. 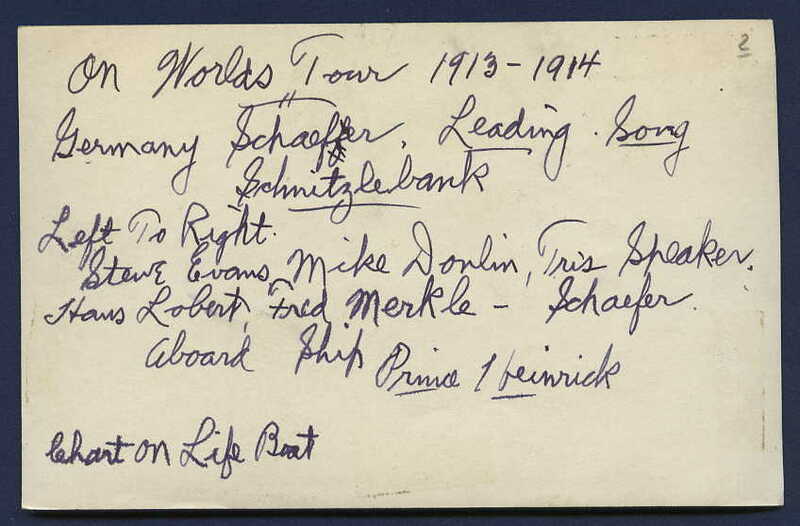 Identifications were made from comparisons to the photo roster published in The Tour To End All Tours by James E. Elfers (see below). 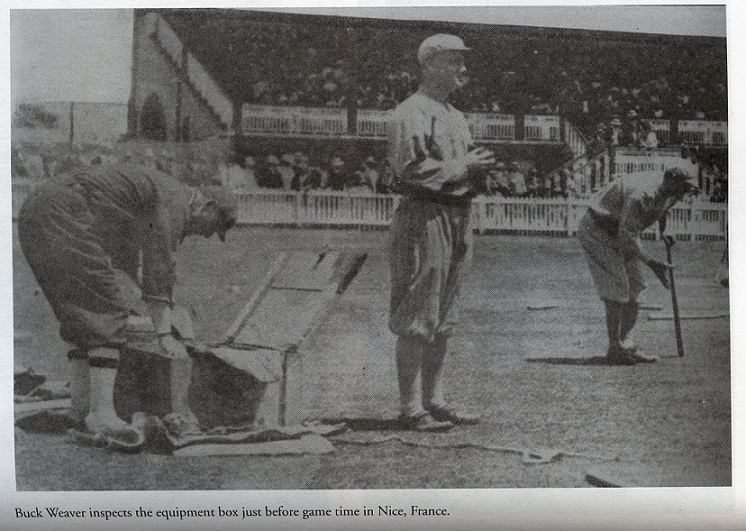 The location of the photo was made from a comparison to an image of the February 16, 1914 game in Nice, France, also featured in the book (also shown below). 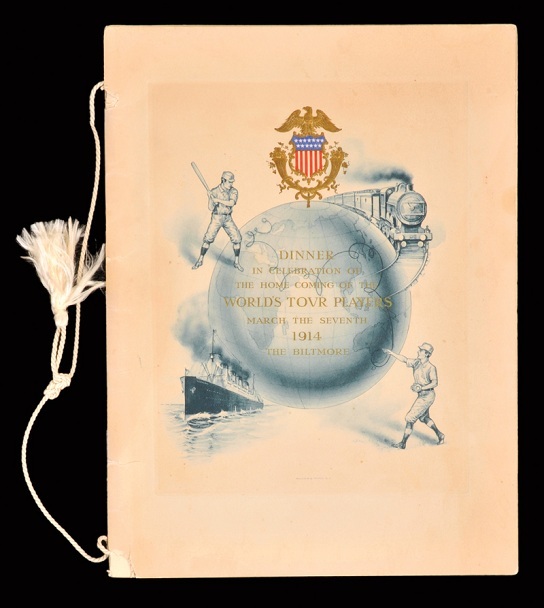 When the baseball tourists returned to the U.S. they were honored with a special banquet at the Biltmore Hotel in New York. This rare banquet program includes the evening's menu, as well as the tour's itinerary, a listing of the players and the night's speakers. The photograph (above) is from the Hans Lobert estate and features some of the tour's players during their incredible journey around the world, which began in October 1913 in America and ended thirty thousand miles and thirteen countries later back in the U.S. in early March. 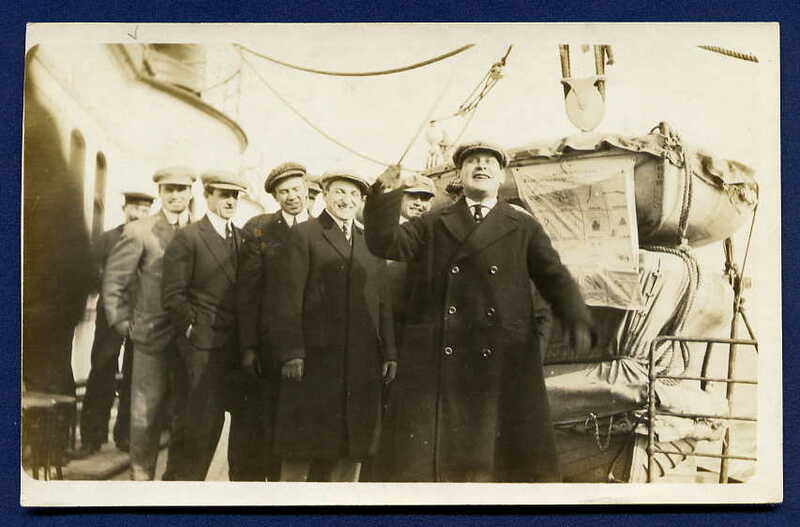 This postcard size image includes Tris Speaker, "Turkey" Mike Donlin, Germany Schaefer, "Hans" Lobert, Fred Merkle, and Steve Evans aboard the Prinz Heinrich, a ship traversing the Mediterranean Sea. The photo was taken between February 2nd and February 7th, as this Hamburg-American Line vessel made its way from Alexandria, Egypt to Naples, Italy. This was the fourth ship the players boarded during their amazing journey. 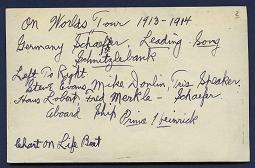 In this image, Germany Schaefer is seen "leading the song Schnitzlebank" -- as per a notation on the photo's back. Schaefer, a member of the White Sox, was a much accomplished player and also the tour's ringleading comedian, as he spent his off-seasons in vaudeville. 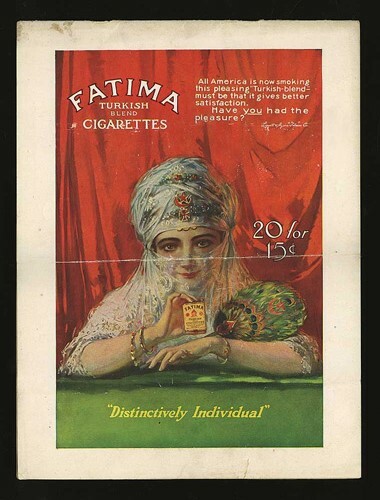 Interestingly, the former Giant, Donlin, had an even more storied vaudeville career, having spent several years out of baseball as an entertainer with his wife, the actress Mabel Hite (who died in 1912). Donlin was signed for this tour from the Newark International League team where he was making a baseball comeback. Joining the two in song were Red Sox centerfielder Speaker (fresh from his 1912 World series victory over McGraw's Giants), Cardinals outfielder Evans, the Phillies speedster Lobert (dubbed Hans due to his resemblance to Honus Wagner), and the much-maligned "Bonehead" Merkle of the Giants. Months earlier, Merkle's error in the tenth inning of the seventh game of the 1912 World Series helped seal the victory for Speaker's Red Sox. This photograph belonged to Hans Lobert, whose handwriting is featured on the reverse. The reverse also makes note of the chart on the lifeboat in the image's background, although the reason for this is unclear. 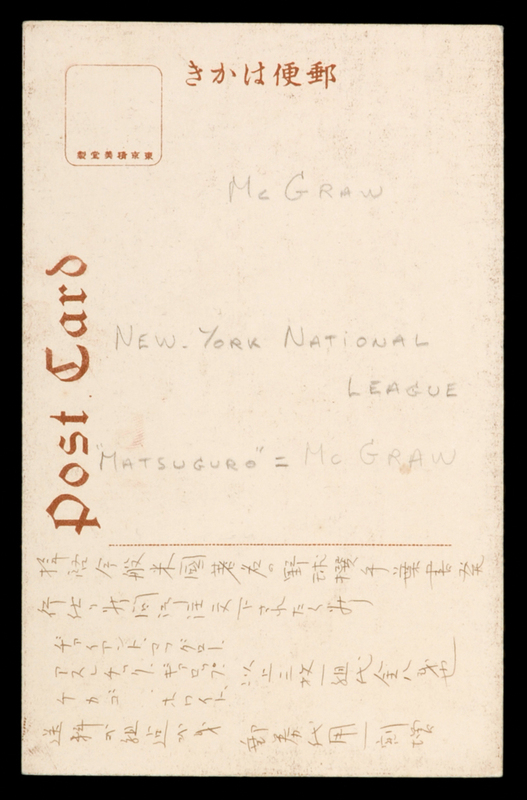 Extremely rare Japanese PC of John McGraw, issued for the 1913 -14 world tour's leg in Japan. The reverse features writing in Japanese, mentioning manager McGraw. By the time the next major tour of Japan occured in 1920, the Japanese were better prepared postcard-wise, as many player cards were issued. 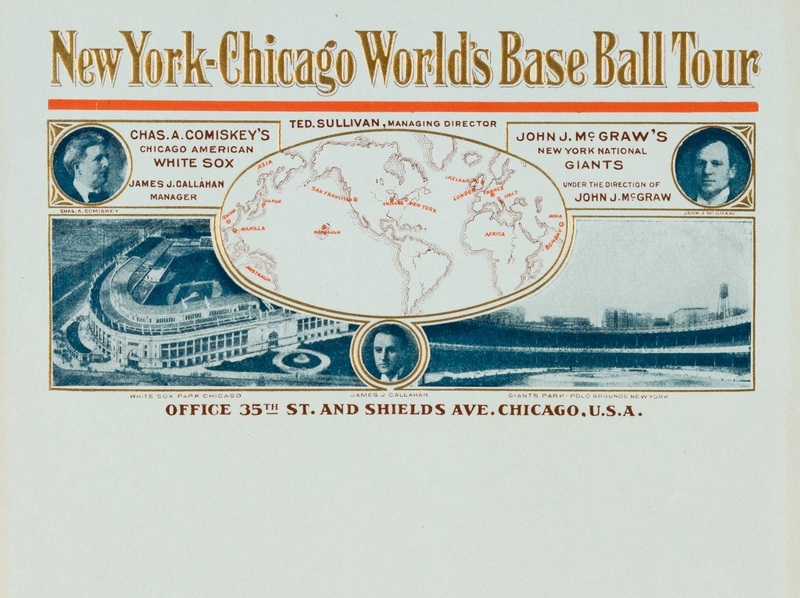 Tour letterhead, depicting Charles Comiskey, John McGraw and James Callahan, along with both the White Sox and Giants home ballparks. In the center is a map showing all the planned tour stops across the globe. 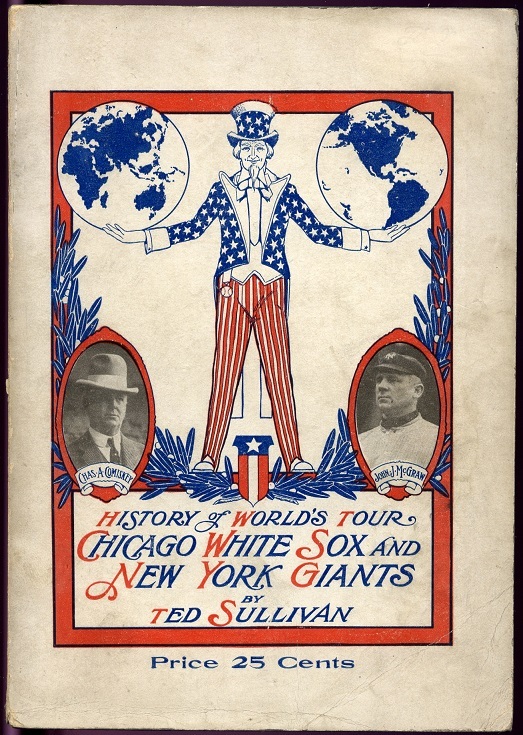 Ted Sullivan helped organize the tour, putting Charles Comiskey and John McGraw together when he learned that both were interested in taking their respective teams on an international tour. Sulivan, who accompanied both teams in their travels as "managing director" of the tour, then wrote and self-published this softcover book in 1914, featuring his account of the tour. Both Comiskey and McGraw are featured on the cover, and the book includes photographs of the intrepid baseball tourists. The entire contents have been digitzed by the Libraray of Congress. 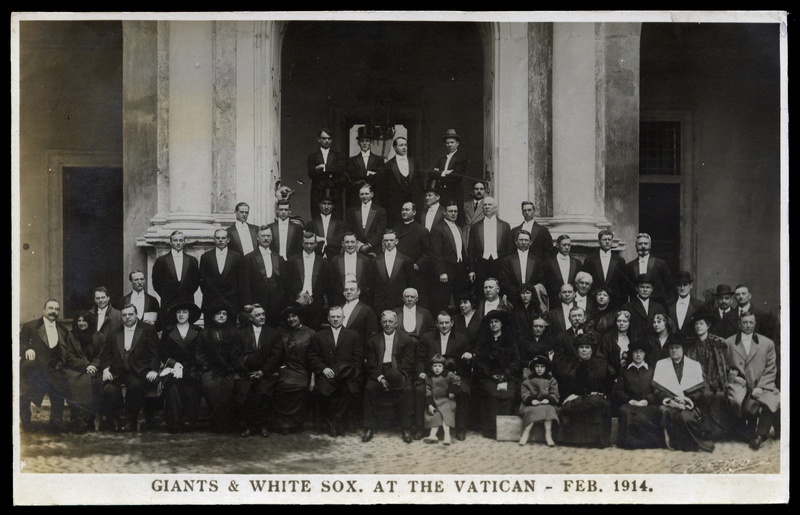 High quality printed postcard of the Giants and White Sox visiting the Vatican in February 1914, when the World Tourists played a stint in Italy. McGraw and Comsikey are seated at front. Such other stars as Sam Crawford, Tris Speaker, Buck Weaver, Mike Donlin, and Red Faber also can be seen, among others. 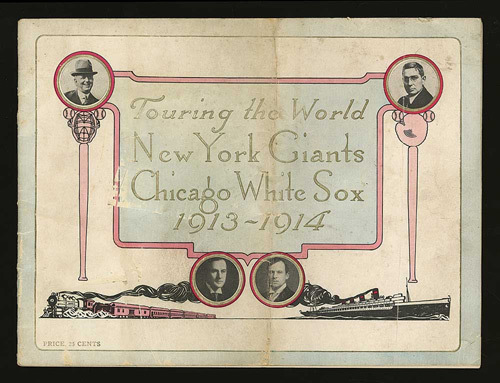 This 32-page program and scorecard, entitled "Touring the World / New York Giants / Chicago White Sox / 1913-1914," features cover headshots of Giants Manager and Owner, John McGraw and Harry Hempstead, along with Charles Comiskey (White Sox owner) and James Callahan (White Sox manager). Inside are photos of the owners of both American and National League teams. The preprinted scorecard lineups include Jim Thorpe, Fred Snodgrass, Hans Lobert, and Christy Mathewson for the Giants, and Buck Weaver, Hal Chase, Sam Crawford, and Ray Schalk for the White Sox. The inclusion of Mathewson indicates this program was issued for the domestic stops on the tour, as Mathewson did not make the trip overseas.